The functions are ready to use apart from two steps. If the panel appears, you will have to follow the button on the right to enable the permission. You only need to do this operation once. 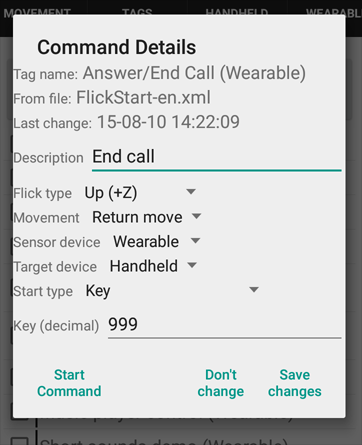 Once everything is set up you can make the phone pick up an incoming call by just doing a roll of the wrist. 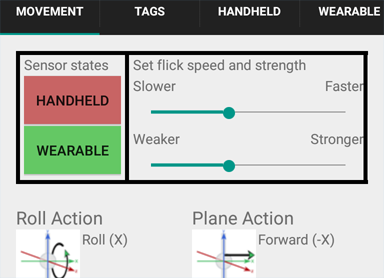 The commands for this function use a 'return move', so you would roll your wrist over and then back again. You might have to do this a couple of times as the watch tends to get busy displaying things and vibrating. 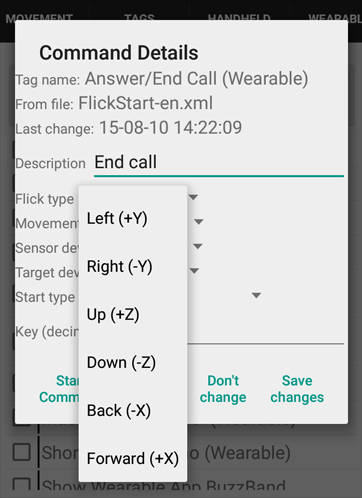 FlickStart ignores motion around a vibration (so that it doesn't accidentally trigger), which is why you might need to repeat the move a couple of times. If you need to hang up at the end a call, you can do an 'up' move with the watch. Again, this is a 'return move' and its a planar move. Hold the watch with the face parallel to the ground and move your wrist up quickly and then back to the starting point but keeping the watch face reasonably parallel with the ground. 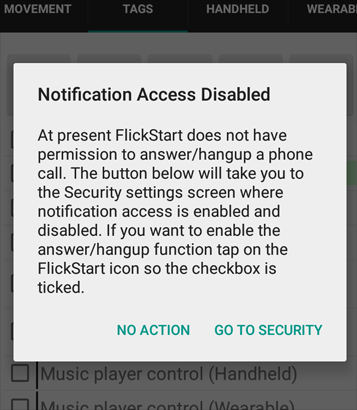 The built-in function plays a sound when FlickStart recognizes your move so that you get some feedback that the call has been ended. 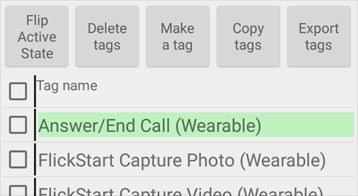 It's likely that you will want to use the 'Answer/End Call (Wearable)' tag over a short period of time such as driving to the office. The best way to stop using the tag is to turn the sensor on the watch off. 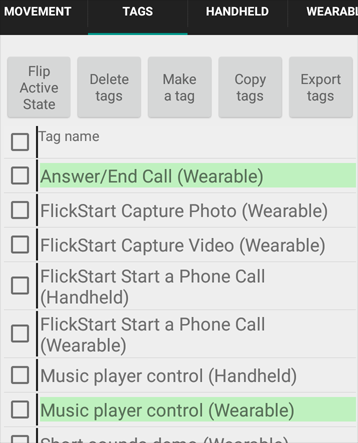 Turning off the sensor also reduces battery drain as FlickStart doesn't have to keep analyzing the sensor values. You turn the sensors on and off on the 'MOVEMENT' tab, or from the card on the watch that appears when you start the FlickStart app on the watch. 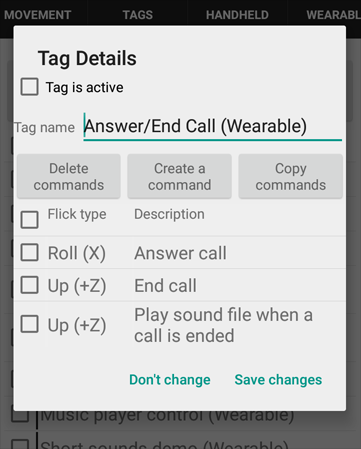 Rolling your wrist always triggers the function to answer the phone when the tag is active, but If your phone is not ringing at the time, the answer function doesn't do anything. The same applies to the hang-up operation. 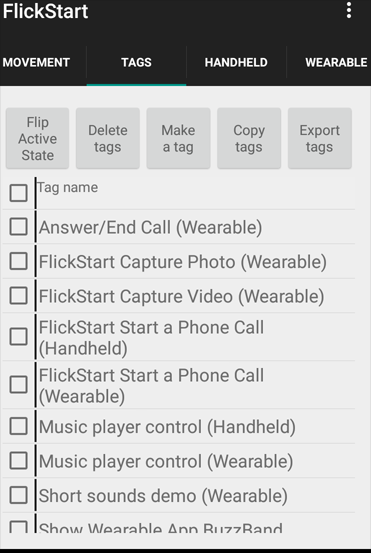 Because of that, you can start/stop your music player with the same movement as answering a call by having both tags active. You can delete a command by checking the box next to the command and tapping the 'Delete commands' button at the top. Choose the type of move (eg. 'Left (+Y)') and keep tapping on the 'Save changes' buttons all the way back to the 'TAGS' tab.